Posted on Thu, Mar 1, 2012 : 11:36 a.m. This year's FoolMoon public art procession and street celebration will take place in downtown Ann Arbor on Friday, March 30, from dusk to midnight, at the intersection of Washington and Ashley streets. Revelers will enjoy hundreds of illuminated lantern sculptures inspired by the University of Michigan's LS&A theme semester, "Language: the human Quintessence." The producers of FoolMoon announced the theme for this year's spectacle just in time for their popular building workshops, which take place at Workantile Exchange (118 S. Main Street) every Sunday in March. Interested members of the community are encouraged to drop in anytime between 10 a.m. and 5 p.m. to create their own luminary sculpture, or just come watch the sculptures come to life. Guest artists will be on hand at Workantile to help community members create the hundreds of luminous floating sculptures that will be featured in this year's FoolMoon celebration. Refreshments will be provided by Sweetwaters and Whole Foods Market to the first 50 participants. Luminary making supplies, tools, and LED lights are being donated by ACE Barnes Hardware stores again this year to help make this a truly local community created and sponsored event. Lots of fun and creative camaraderie was shared last year, with more than 250 people dropping in to make luminaries of their own. (For those who can afford it, FoolMoon organizers are asking for a suggested $10 donation this year to offset the costs of the workshops and related public art events). 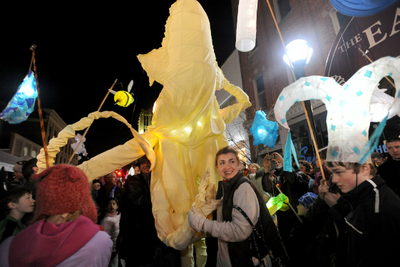 FoolMoon and its sister event, FestiFools, are always free and open to the public. For FoolMoon, participants will gather at dusk on Friday, March 30 at one of three different "Constellation Stations"—Kerrytown, Slauson Middle School, or the U-M Museum of Art—to begin the fantastic processional that winds its way through the sidewalks of Ann Arbor, culminating in a celebration at the downtown intersection of Washington and Ashley streets. The second annual FoolMoon event will feature entertainment by the eclectic and expressionist percussion ensemble Juice, followed by the Third Coast Kings, a funk and soul dancin'-in-the-streets party machine. Mark's Carts will be open for business, and a special brew called "FoolBrew" (proceeds to benefit FestiFools and FoolMoon productions) will be on tap at the Grizzly Peak beer tent. FoolMoon is an outgrowth of FestiFools, a parade of oversized puppets through downtown streets that will take place this year on April 1. Tue, Mar 13, 2012 : 5:08 p.m.
With regard to the theme: &quot;Language, the human quintessence.&quot; Safe to say that it has something to do with all of these downtown dispensaries! Sun, Mar 4, 2012 : 2:20 a.m. Sat, Mar 3, 2012 : 10:51 p.m. The Mark's Carts vendors are excited to serve food during the event! Fri, Mar 2, 2012 : 12:53 a.m.
Thu, Mar 1, 2012 : 10:58 p.m.
Huh, restructuring? I sure hope everything is a-okay? Thu, Mar 1, 2012 : 5:08 p.m.
My family had a fantaastic time at FoolMoon last year. We can't wait to do it again!